Mary Eileen Johnston is known in our area as a musician of diversity. As a vocalist and multi-instrumentalist, she has attained certifications in music therapy, music education, and liturgical music. 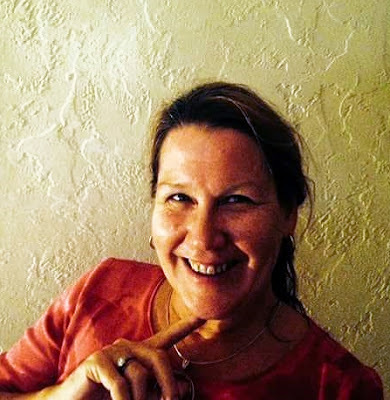 In addition to making music as a soloist and in ensemble, Mary Eileen has directed vocal ensembles, written and produced musical performances with special needs, recorded original lullabies, and is called on regularly by her fellow professionals for consultation. New Horizons Glee Club was introduced to our new director by our drummer, George Cocco, with whom she shares participation in another volunteer band in Delaware County, "Legends". 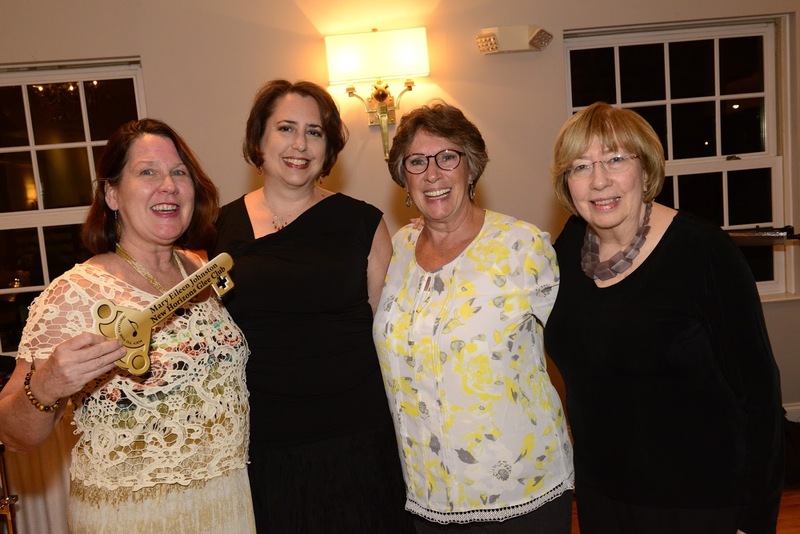 When presented with the symbolic "New Horizons Key" at the Club's annual dinner in June 2017, she announced, "May this be the key to our musical journey together." 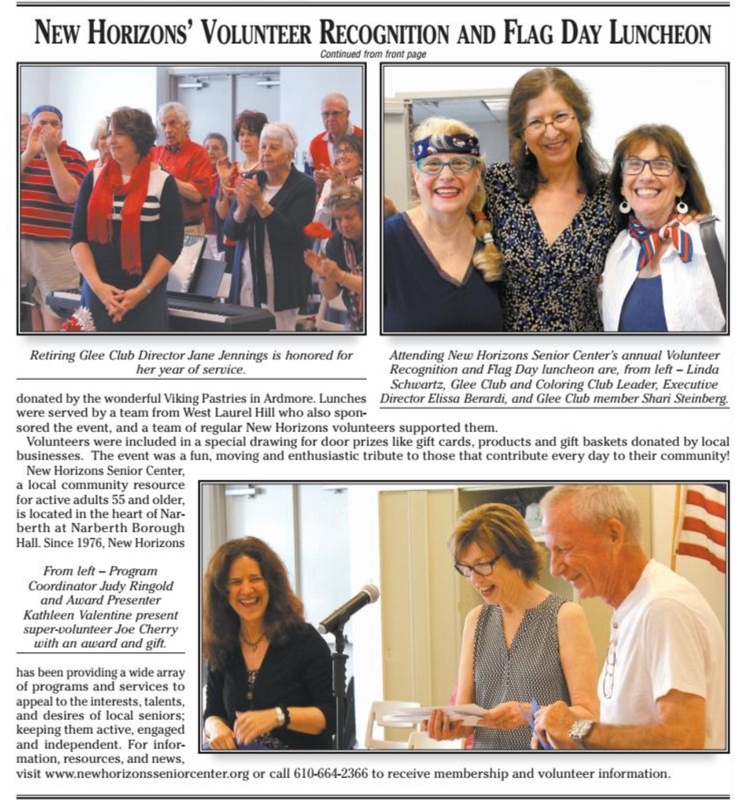 Widely recognized for 25 + years of performances for senior groups and schools in the Philadelphia area, the New Horizons Glee Club presented a "stirring" Musical Melting Pot program on June 16, 2017 in our 2016 - 2017 season under the direction of Jane Jennings. For more information or to schedule a program for your club or organization please call or email Pat Cocco or Debbie Zug whose contact info can be found in the upper right box on this page. New Horizons Senior Glee Club's Facebook Page! The New Horizons Senior Glee Club is an award-winning ensemble of over 42 volunteer singers and musicians. The group performs at nursing homes, retirement communities and other groups that serve the elderly. Member’s ages range from 60 to 92. 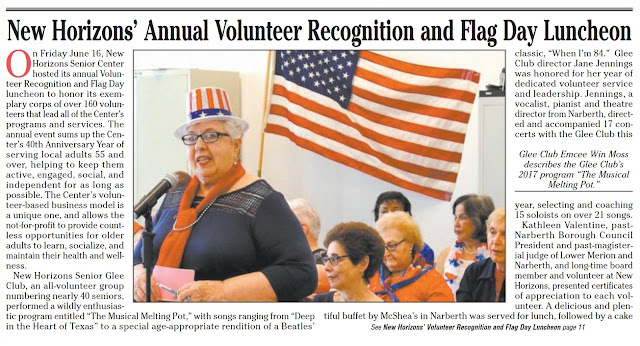 We were named GOOD WILL AMBASSADORS OF MUSIC by the community of Narberth, PA. Our music is from the Great American Songbook featuring works by Gershwin, Berlin, Porter, et al. Recent concert titles include "Senior American Idol," and "Broadway Lights - Cabaret Nights" and "Broadway Empire." Our concerts number about 35 per year. We have received awards from local officials, eg. the Governor's Gold and Silver Award for service to older Pennsylvanians. We are sensitive to the fact that many older and frail individuals are no longer able to go out to seek the cultural arts on their own, and our audiences tell us again and again that our musical performances are the highlight of their day.